Posted on April 7, 2019 by J. President Donald Trump's defenders professed outrage on Friday at comments from Beto O'Rourke, a Democratic presidential candidate, who accurately observed that the president's rhetoric on immigrants would not have been out of place in Nazi Germany. | Speaking at two campaign events in Iowa, O'Rourke said that Trump's policy of separating the children of asylum-seekers from their parents as they cross the border, "follows the rhetoric of a president who not only describes immigrants as rapists and criminals, but as animals and an infestation. 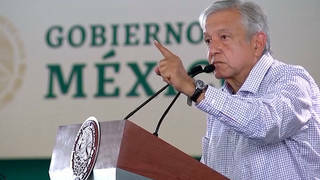 As President Trump continues his threats to close the U.S.-Mexico border to stop the flow of asylum seekers, we look at the response from Mexican President Andrés Manuel López Obrador and the first four months of his presidency. In Mexico City, we speak with Humberto Beck, professor at El Colegio de México and co-editor of "The Future Is Today: Radical Ideas for Mexico." He says that while López Obrador doesn't want to openly confront Trump on stopping immigration, "he knows that sending back migrants to Central America is sending back these people to unlivable situations."